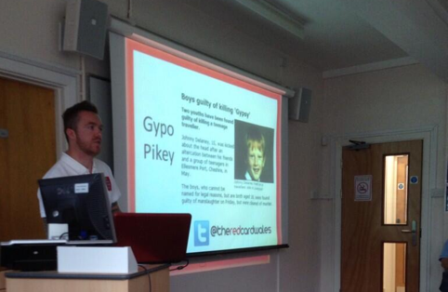 Show Racism the Red Card Wales held their first Trainee Teacher Conference of the 2013 – 2014 academic year on Thursday at the University of Wales Newport. The team were back in Caerleon for the 4th year in a row to launch the new, bigger than ever training partnership with the NUT which will see SRTRC visiting every single ITT University in Wales. The day saw over 50 final year Trainee Teachers put through their paces in a wide variety of workshops all aimed at improving confidence and knowledge and empowering the future teachers to deal with racism in the classroom and society. First up was an introduction to the day, delivered by Welsh Education Manager Simon Richards. It was a session that looked at the legal definitions of racism and racist incidents, steps to take to deal with issues and aimed to ensure that the trainees felt comfortable asking questions and fully engaging in workshops. Then students took part in a terminology workshop, led by Education Worker Chris Stokes, that aimed to improve the trainee’s understanding of racial language and to widen their knowledge of acceptable / unacceptable words. The session also looked into the reasons why certain words are unacceptable by going back into the history of their use and the links to pain and suffering that exist. Next was a chance for the Trainee’s to try their hand at some of the activities that the SRTRC Wales Education team use in schools. They were also shown the different Powerpoints that our team use and given tips on how to deliver an excellent anti-racism session with young people in the resources Workshop. Finally there was a chance for Trainees to use all of the knowledge they had gained over the day during a Scenarios – What would you do? ‘workshop delivered by the team. Real life, school based, scenarios were showcased and the trainees were then asked to step in at certain points and deal with the issues. This was a great way for Trainees to try out different approaches in a safe environment. · 77% of delegates stating that the conference was Excellent and 23% saying Very Good. –this rose to 84% confidence after the conference. Also interestingly 100% of the Trainee Teachers said this was the first time they had ever received any kind of training in this area.